This debut collection by Cave Canem fellow Geffrey Davis burrows under the surface of gender, addiction, recovery, clumsy love, bitterness, and faith. The tones explored--tender, comic, wry, tragic--interrogate male subjectivity and privilege, as they examine their "embarrassed desires" for familial connection, sexual love, compassion, and repair. Revising the Storm also speaks to the sons and daughters affected by the drug/crack epidemic of the '80s and addresses issues of masculinity and its importance in family. Geffrey Davis holds an MFA and a PhD from Penn State University. A Cave Canem fellow, Davis is the recipient of the 2013 Dogwood First Prize in Poetry, the 2012 Wabash Prize for Poetry, the 2012 Leonard Steinberg Memorial/Academy of American Poets Prize, and the 2013 A. Poulin, Jr. Poetry Prize. He currently teaches at the University of Arkansas. Geffrey Davis holds an MFA from Penn State University (2012), where he's completing a doctoral dissertation on American poetics. A Cave Canem Fellow, he is also the recipient of the 2013 Dogwood First Prize in Poetry, the 2012 Wabash Prize for Poetry, the 2012 Leonard Steinberg Memorial/Academy of American Poets Prize, and the 2012 A. Poulin, Jr. Poetry Prize. 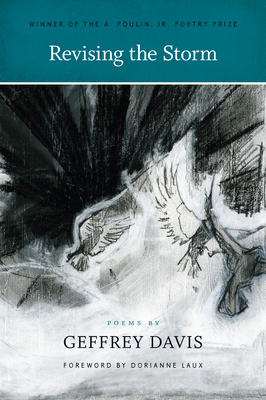 Davis has poems featured or forthcoming in a variety of journals, among them Crazyhorse, Massachusetts Review, Mid-American Review, Hayden's Ferry Review, Mississippi Review, Nimrod International Journal, and Sycamore Review. He considers the Puget Sound area "home" -- though he's been raised by much more of the Pacific Northwest (Tacoma, WA), and now by central Pennsylvania as well. Dorianne Laux's most recent collections are The Book of Men and Facts about the Moon, both from W.W. Norton. A finalist for the National Book Critics Circle Award, and winner of the Paterson Poetry Prize, the Oregon Book Award, and The Roanoke-Chowan Award for Poetry, Laux is also the author of Awake (her first book of poetry), What We Carry, and Smoke from BOA Editions. Laux's poetry has appeared in numerous American journals and anthologies, and she has received poetry fellowships from the MacDowell Colony and the National Endowment for the Arts. She teaches poetry in the MFA Program at North Carolina State University and is founding faculty at Pacific University's Low Residency MFA Program.